The ketogenic way of eating is no longer a diet for us but a lifestyle. There are few ingredients around the house which don’t fit into our way of eating and that makes meal preparation extremely easy for us. I’m particularly proud of this recipe because it was an experiment. An experiment that turned out delicious. All of the ingredients were left over from previous recipes we’ve made or purchased for recipes we never actually made. This Italian Stir Fry may not be a traditional stir fry and that’s ok. I called it that because it felt silly to cook it in a Wok . Begin this recipe by adding your olive oil, garlic, onion and dry spices (Oregano, Basil, Lite Salt and Pepper) in a medium sized pan, or in this case, a Wok . Turn your stove on to a medium to medium low heat. Allow the garlic and onions time to sautee until soft. By adding the dry spices now you allow time for their flavor to dissipate in your oil. Slice your chicken in to small chunks or cubes and add it to the wok once your onions are mostly soft. Add 1 tbsp of red wine vinegar at this point. Increase the temperature to medium-high and cover allowing the chicken to cook until no pink is seen. Slice your salami and roasted red peppers thin and add to your pan. Add your Kale at this time as well. Mix well and cover until your greens are cooked. They should appear wilted but not a slimy green mess. Take the pan off the heat. Place the ricotta cheese in spoonful sized dollops around the top of your stir fry, cover, and allow it a few minutes to melt. You can lightly disturb the cheese with a spoon to work it into the ingredients as well. Dish 1/4 of the recipe on serving plates and add a drizzle of your pizza sauce and garnish with grated Parmesan Cheese. This is optional but highly recommended. Enjoy! 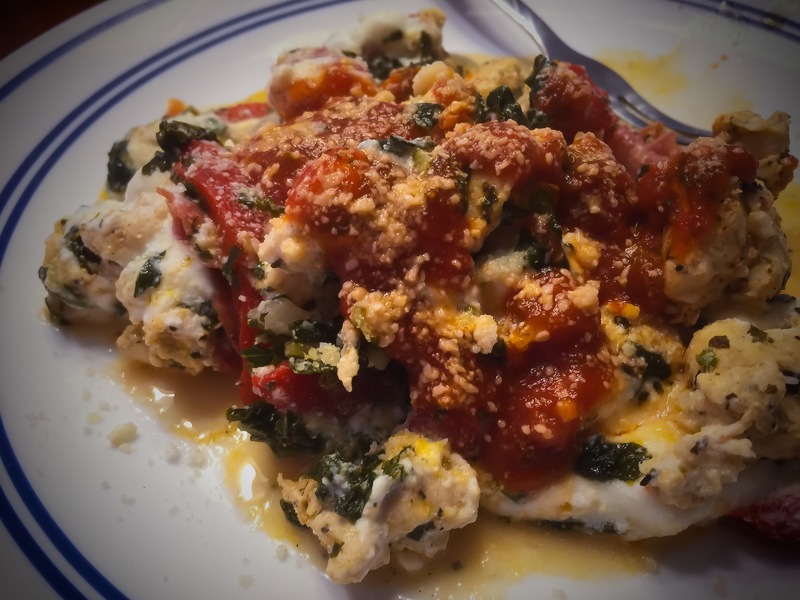 This entry was posted in Dinner, Recipes and tagged banting, cheese, chicken, Dinner, easy, idea, kale, keto, ketogenic, lchf, lite salt, low carb, marinara, meal, mozzarella, onion, parmesean, protein, recipe, reddit, salami, sauce, supper, vinegar by Jeff Levers. Bookmark the permalink.